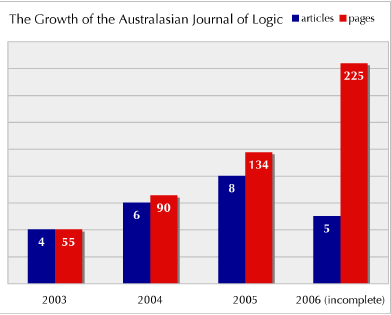 This morning I uploaded a few new papers to the Australasian Journal of Logic, one of the projects I (mostly!) enjoy working on. It’s an open access, fully refereed, online journal in logic. If you’ve not seen it before, browse around and check it out. Let me know what you think. One thing that an online journals make possible is the freedom from constraints of filling a fixed number of fixed-size volumes a year. Different ejournals do this differently. At the AJL, we publish one volume per year, but papers appear in the volume whenever they complete the refereeing and editing process. We close the volume at the end of the year, and start a new one in the next year. This means that wherever one paper is in the queue doesn’t block the progress of any other paper. We can publish Tony Roy’s massive 146 page Natural Derivations for Priest An Introduction to Non-Classical Logic without worrying that this will delay the other things in the queue until the next volume. Tony’s paper has meant that we’ve well-and-truly broken our pagecount record for the 2006 volume, and we’re only in March.